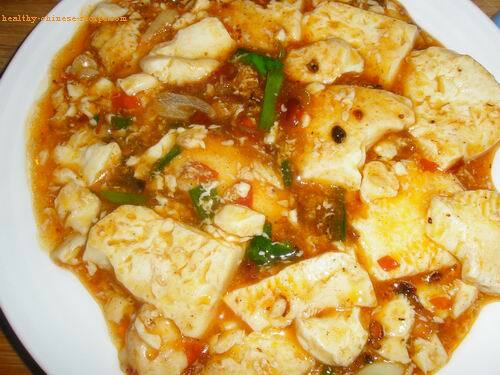 Traditional Mapo tofu recipe has ground pork or beef. This is vegetarian version. It can be made in minutes and made a little lighter. 1. Cut tofu into about 1cm thick flakes. 2. Heat oil in a wok, add Sichuan chilli pepper and pepper corn, sway the wok in low heat. 3. Slip in tofu flakes, sway the wok to let the tofu spread evenly. Simmer for 5mins. Add a little stock or water if dry. 4. Mix cornstarch and water well. Add half in a wok in medium heat. Sway the wok. When it's coated well, add the rest cornstarch. Sway the wok. 1. Pixian paste is very salty. One tbsp is salty enough for the dish. 2. If you cook more tofu you can add some soy sauce in the Thickening.